With 1st ice being reported online. I just wanted to post up a safety reminder to all the ice addicts we have here as members and to those lurking for 1st ice. Try to not go alone, use the buddy system if possible. 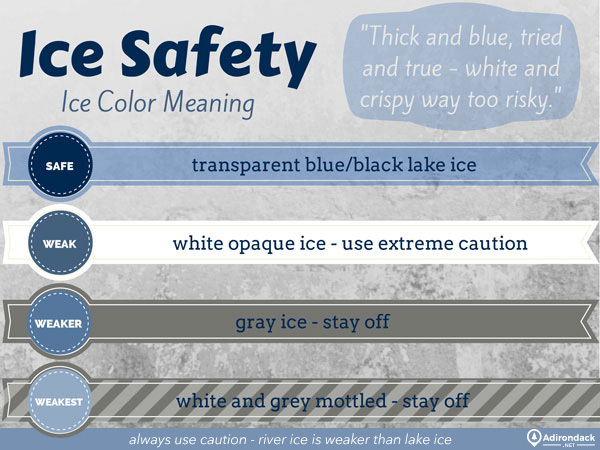 Always check the ice thickness regularly as your moving out onto the water. Drilling test holes as you go out is always a good idea to gage the good dark clear ice underneath the white soft stuff. Ice consistency can very from foot to foot so don't even ever think that you have the same thickness across the hole cap just cause you checked it by the shore. This process can take a few more minutes of your hard deck day but its worth it. A spud/chisel bar is recommended highly and can be purchased for fairly cheap these days, if not that then an axe will work also. I have all of these products and for a total of under $80 for the stuff I listed above (with $20 cleats) its worth it to me. Purchase this stuff from where ever you choose, I just wanted to give everyone a visual picture of what I'm talking about. But by all means support our I.S. sponsors. Feel free to add any tips to this post peoples. Great post Musky, I am sure we have all had some near misses on the ice. Better safe than sorry. Not worth it for fish. I also have been thinking about those that have been found in tents full of carbon monoxide. Best to check those heaters and make sure that vents are open and that the precautions are taken when heating those shacks. Good luck everyone, tight lines. Great post Musky and great reminder to think of the "other" equipment and supplies for the vehicle too. It doesn't take much to find yourself in a pickle. On the way to the Scofield tourney in 2015, we were the first vehicle to come upon an overturned car on HWY 6. As the young lady crawled out of the car in the ditch, we were glad that we had an extra coat and blankets to wrap her in for the 30 min it took the first responders to arrive. Thankful for my buoyant clothing today when 1 step took me from 3" to slush. Both feet went through up to my armpits but I floated like a cork. Swam out no problem and continued fishing for a couple hours. Be safe and be prepared. Also a good thing is to have a partner and spread out. Don't both be walking Side by side. We also try and not be tied off to our sled just pulling it. I forgot the most important thing we do. We purchased the auto inflate Life jackets from cabales.. They are super comfy and you can put them on when walking out then take off re adjust after getting comfy in your tent. Also we carry a boat seat floatable. They are light weight fit in the bottom of the sled and you can us it to sit on for padding. Walmart has them pretty cheap. Easily thrown or you can slide them across the ice. All great charts and information! Thanks for sharing! Thanks Matt it's always to remind people. I still never drive my pickup on the ice. The ATV yes, carefully on less than a foot. I did buy on sale a Cabelas self inflating life vest last Spring, $130 marked down from $180 Can't wait to try it out...Oops, to feel the comfort of wearing it. Has 40 pounds of lift, pretty maxed out, takes 12 to float a person. Has a panic pull cord which is for reasurance. That might be a good topic for a thread, the life preserver thread. Let them go so they can grow. While a coiled rope is better than nothing a rescue rope in the bag is more accurate to throw . practice a few times and hope you never have to use it. Be familiar with all your equipment before. A situation arrives. Be safe and good luck! Feel like I need to bump this back up to the top with it being late in the season. I let my guard down yesterday at Pineview (near browning point) and ended up going through the ice. Luckily I was able to get out and back to the car to change into dry clothes without having to make the news. Be careful out there boys, it's not worth it. Hate to see it starting to end. Be safe out there as everything starts to get warmer. Minus 16 yesterday, currently minus 21, and going to be below zero again tomorrow for the low temp! Ice will be around for awhile in northwestern Wyoming! Ice Fishing - it's not just for breakfast anymore. Edges are getting real bad at Echo. 6-10' of water before hitting the safe ice in many places. Main ice is still 15" or so (March 2). The fishing makes it worth it though...as long as you have a safe way to get on and off.